Here you can download Rybka 2.3.2a (for free) or purchase Rybka 4. There's also information on the official Rybka 4 opening book by Jiri Dufek. If you want to know more about Rybka, please read the Rybka FAQ. 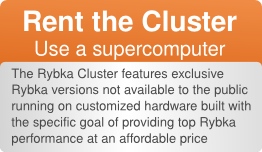 For Rybka 3 customers the Rybka 3 user area may be interesting.